I somehow managed to Rope Dawn Wood into doing an interview with me in which we talked about her art career and her ventures into things like illustration and a few other awesome things here and there. I found Dawn to be funny, engaging, and proud of her accomplishments which speak for themselves. Look at some of the images here – they are amazing works. I talk about these things and more below. Joshua Pantalleresco: Can you tell me a bit about the Sultan’s Prize? Dawn Wood: In 2013 I was at a loss of what I would create for that year’s KVIE Art Auction’s entry. With only 2 weeks until the due date and completely desperate for inspiration, I went onto Facebook and implored my friends for assistance. One tossed out the suggestion of creating a peacock mostly to satisfy her own curiosity to see if I could paint an animal that complicated. I’m not sure if it was morbid curiosity about my own skills or the fact that I was running out of options at the time but I took the challenge. From start to finish, the painting itself took me a week and a half with me spending between 12 to 15 hours per day complete the piece before the deadline. 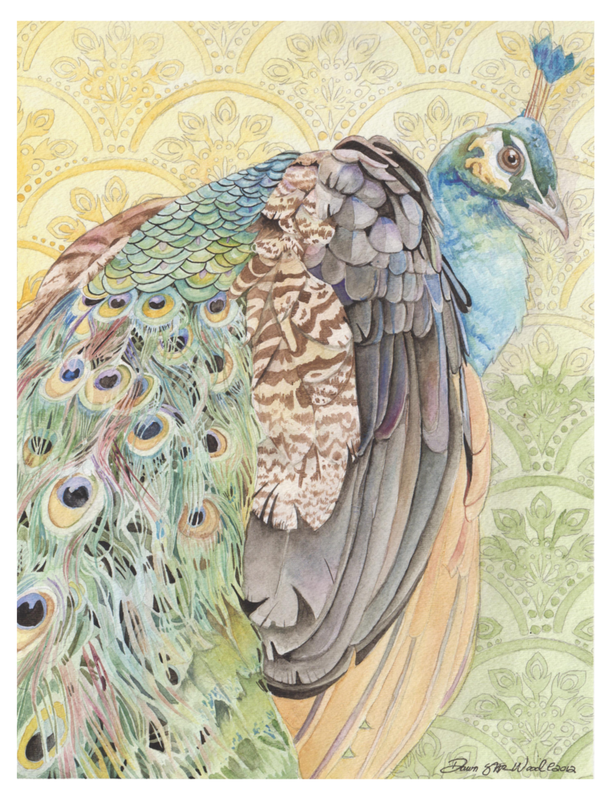 The title itself came pretty naturally once I had completed the painting because for me it reminded me of some tails of Sultans and nobles of the Ottoman Empire and their love for exotic animals. JP: What are you working on right this minute? DW: I actually have a couple of projects that I’m working on at the moment. One is illustrations for a collaboration that I am doing with my friend, photographer Stacy J. Garrett. We are combining forces and blending my paintings and her photography to tell a visual story as an art book. Other projects are private commissions for customers in various stages of completion. JP: How did you break into doing art professionally? DW: I’ve always aimed to become professional even through my schooling. Once I graduated college, I attempted to find a regular job but due to not having the amount of years of experience that some positions were requesting, I was at a loss of what to do with my life and thought my dream was going to slip through my fingers. It was when my father came to me and encouraged me to start a home business focusing on my art that I realized that if I was to have this as my profession that, that moment was the time to start. JP: Your dad is awesome! So, then, who were/are your influences as an artist? DW: I have actually several individuals who have influenced my current style such as Gil Elvgreen and Alphonse Mucha. Two fellow artists who I am honored to call friends – fellow watercolorist Stephanie Pui-Mun Law and hyper realistic painter Denis Peterson. 2 years ago I came across another artist who I have been enjoying to follow is Yoann Lossel. JP: You’ve recently been doing some illustration. What challenges have come to you entering this new medium? 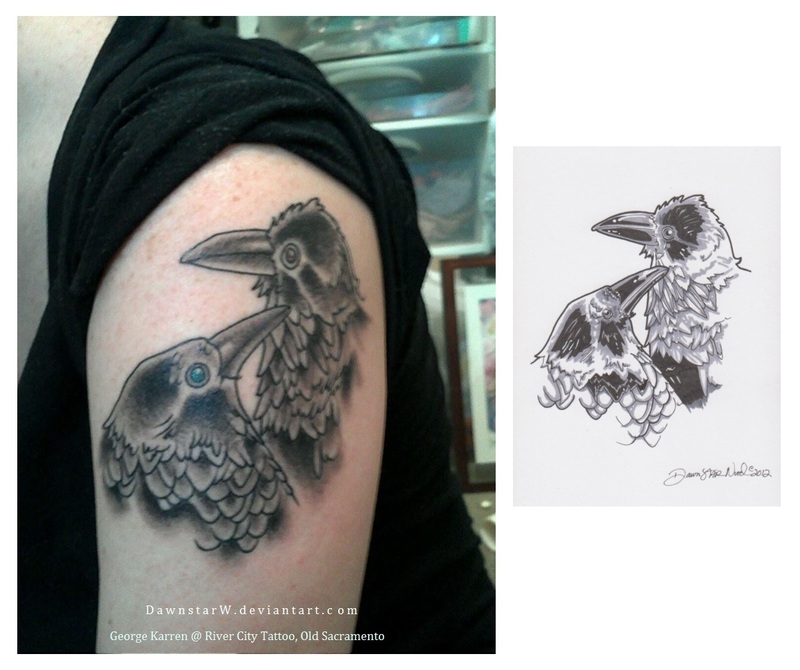 Are there any similarities to illustration compared to what you have done in the past? DW: As far as art goes, my main focus is fine arts. Illustration, though for the most part new to my list of skills, strangely feels like a natural branch off of what I already do. The only difference is, in my case anyways, is that I am creating a piece of art work that is meant for the cover of a book. This means that I need to listen carefully to not only what my client is wanting to portray visually, but have it so that it makes sense while keeping in mind the format needs to have room for a title, author’s name, and plot description. JP: Talk to me about your covers. What stuff has appeared recently? DW: My work on books is a recent thing and right now can only speak of 2 particular ones since they are currently available. The first book I worked on was children’s book ‘Twinkle the Christmas Mouse’ written by Talina L. Collier where I was asked to step in as a colorist during Winter 2014. The second was a book cover for short novel ‘Shadow on the Sea’ written by Etta Jean. Both books are currently available to order through Amazon or their author’s respective online shops. JP: What medium are you most comfortable in? DW: My main medium is watercolors but I do occasionally do work in acrylic on board, ink on paper, and mixed media on paper. It completely depends on what I’m working on but I always go back to watercolors. JP: What is the appeal of watercolor for you? DW: I enjoy the subtle colors and shading that I can do with watercolors and have learned how to do fine details using such a difficult medium. JP: Do you see yourself doing any mediums beyond what you are doing now? DW: I have been considering a slightly insane personal project which involves me creating my own natural dyes and paints and attempt to do a piece in honor of various old world traditions that are sadly dieing out. Of course this going to take a great deal of research, studying and of course trail and error on my part. Of course as I said, this is going to be a personal project so there’s no set date of completion. DW: I really don’t have an absolute favorite single subject that I focus on. However I have genres that I enjoy to work with are Asian, European, Floral/Fauna, and Classic Vehicles. JP: Any particular periods with Asian/European Art that grab you? 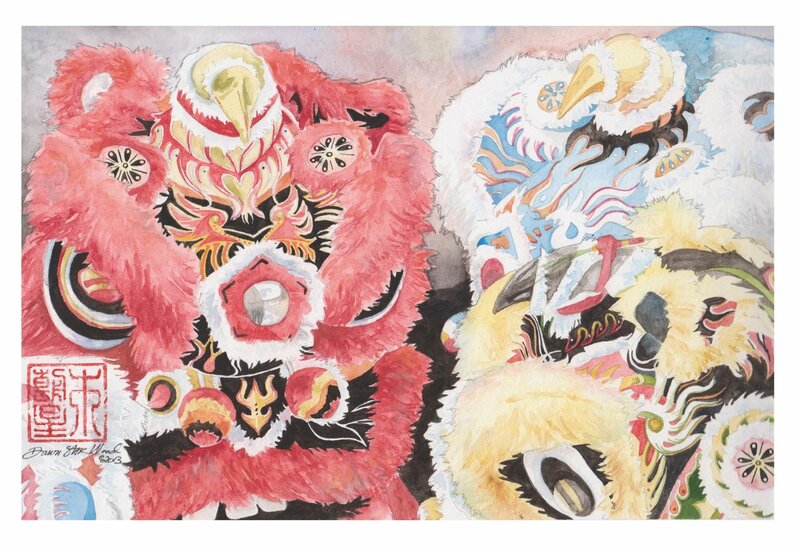 DW: When it comes to Asian art, I love the intricacy of the Japanese woodblock prints from the 1700s to late 1800s, the subtle textures of Chinese ink paintings from the 1200s to early 20th century, the traditional masks of Bali, and the textile stamps of India. As far as European art, I usually lean towards the skillfully carved Celtic and Norse statuary and jewelry, illuminated manuscripts, and the works that spanned from the Renaissance to the Baroque periods. If you look at any of my work, there always seems to be a mix of all of these influences in there. JP: What are your favorite classical vehicles? 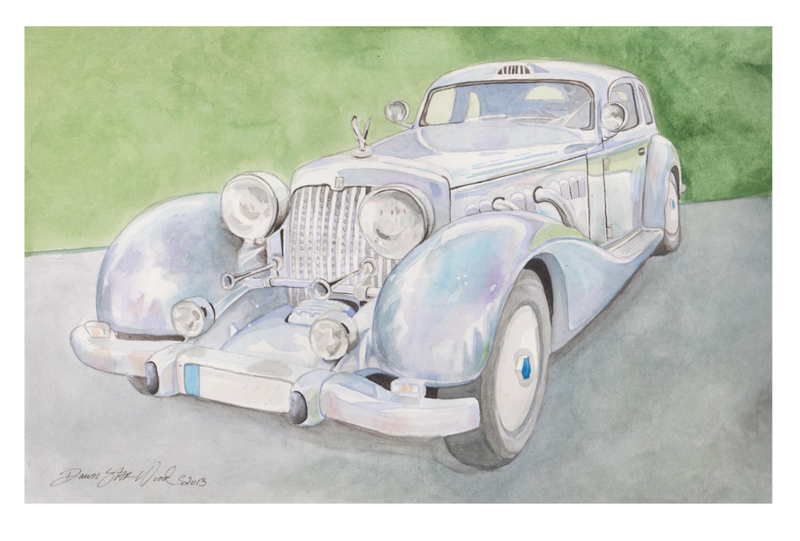 DW: I love the variety of classical vehicles that are out there but as far as subjects to paint, my favorites have been the early 1940s Cadillac, 1954-56 Bel Air, and oddly enough the engines of Harley Davidson and Indian motorcycles. JP: Tell me a little about the auction you’ve just been invited to. DW: KVIE is a public broadcasting television station for California and since a large portion of their money to continue broadcasting educational programs comes from donations, every year they have the KVIE Art Auction. What the art auction does is invites artists across California to enter. Only about 200 artists are accepted and all proceeds of the auction go to KVIE. As far as the works that have been accepted, they are judges in 6 categories and have a chance of winning 1st, 2nd and 3rd places, Juror’s Choice, or Best of Show. This year will mark 8 consecutive years that my work has been accepted into the auction and I am always happy at the thought that my donation of art is in some way helping fellow viewers. If you want to see more of Dawn’s work check out her Deviant Art page here: http://dawnstarw.deviantart.com . If you want to talk to her about projects, you can check her out on facebook here: https://www.facebook.com/pages/Dawn-Star-Wood-Art/140121929492512 . I want to thank Dawn once again for being gracious enough to engage me in this interview. Maybe someday I will be lucky enough to work with her. Finally, if you get the chance, check out her work at the KVIE auction. It’s for a good cause and you can bid on amazing stuff like this and more. So this is Part one of a two part crossover. I arranged to interview Sharon to do a multi blog epic interview where we each take turns interviewing the other. My life became a touch insane so this has taken longer to start with than anticipated. That said, upon conversation I discovered something very important. Sharon is a really nice lady. I know. Huge revelation right here in this blog. I know I really shouldn’t be saying this. Sharon has already vowed revenge on me for making her come out as a unicorn, and me saying this will ruin that diabolical reputation, but it had to be stated before you continue here. She is charming, and sweet and one of the nicest people you will come across. Her books are nearly as awesome as she is. Her book, The Last Timekeepers and the Arch of Atlantis will soon make its debut with Mirror World books and it’s fantastic. You really should read it. Now this time, there are only 5 questions, and 5 answers with Sharon. At some point down the road, i hope to have a full conversation with her. In the meantime, here are the five questions. Sharon Ledwith: Right now, at this minute, Joshua? Um…answering your questions. Wink. JP: What are you working on specifically? SL: Ah, there it is—the money question! 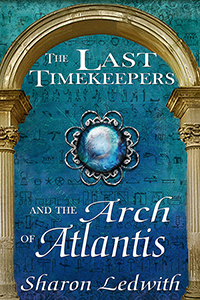 Well, I’ve just finished the edits for The Last Timekeepers and the Arch of Atlantis, which is book one in my middle grade/young adult time travel series. The novel is being re-released world-wide through Mirror World Publishing on June 17th, 2015. I’m also just finishing up with edits and changes for my paranormal romance/suspense book Moontouched, to submit to my agents at Walden House (Books & Stuff) within the week. Once done, I’m back in the writing saddle to work on the second book in The Last Timekeepers series. SL: To write? Hmm…actually I never thought I could write until I heard this strong, vibrant voice behind me blurt out that I could write. Yeah, I know. Freaky, supernatural stuff. But it’s the honest truth. So I went with this truth that I could actually write a book, and wrote a book! Granted it took me two years to write it. And during that time, I took a few courses on how to plan a novel in night school, and worked at my craft consistently. I read self-help books on writing too. Lots of them. So I guess to answer your question is that my environment influenced me. Listening to my intuition. Watching people and how they acted. Hearing how people talked to each other. What the world around me smelled like, and tasted like. Reading a lot of fiction in the genres I enjoyed the most, and seeing how the authors created their stories helped tremendously too. Success leaves clues, after all. JP: What are you most proud of accomplishing? SL: That’s a tough question to ask, Joshua. There are a ton of things I’m ‘most’ proud of! But if you’re talking career-wise (writing) then I’ll have to go with conquering my fears. At first, when I heard that powerful voice who told me that I could write, I immediately put up road blocks. My reasoning was that only those people with a master’s degree in English or MFA holders or teachers were suitable for the writing profession. Not me. I didn’t even get great grades in English. Then, I thought, screw it! Let’s see where writing takes me, and I pushed past the fear. And today, I’m glad I made that decision to let the fear fall away. By the way—that first book that I wrote was Moontouched, and has been finally contracted by my agents this year. See how things work out when you face your fears? JP: What is your favorite thing about the changing face of publishing? SL: That the gatekeepers between authors and readers have all but dissolved. Think about it. Before the digital age, publishers handled the relationship between the authors and their readers. Book signings (or school visits and conventions) were really the only way of connection that a reader could meet and greet with their favorite author. Now there’s the social media with Facebook, Twitter, Pinterest, Goodreads, and a multitude of other social sites where readers can connect with authors. This is something I never imagined when I started writing back in 1996! Look for my answers to these questions soon. In the meantime, you must check out Sharon’s work. Her book, the Last Timekeepers and the Arch of Atlantis debuts this wednesday. Pick it up because it’s amazing. There’s a webpage about located on facebook here: https://www.facebook.com/pages/The-Last-Timekeepers-Time-Travel-Series/373953795955372 . Sharon herself is on facebook here: https://www.facebook.com/seledwith. 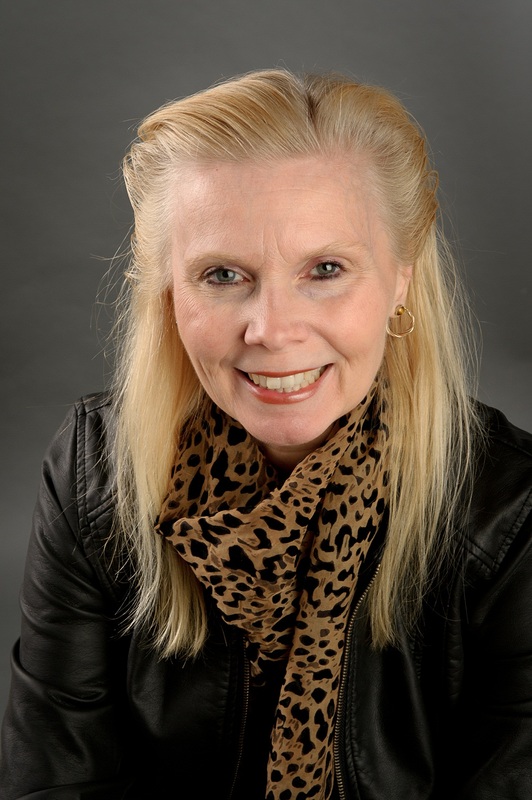 Her twitter handle is @sharonledwith and her webpage is http://www.sharonledwith.com. I look forward to reading more of her work in the future. Check her out if you are a kid or a kid at heart. I want to thank Sharon for her time and me letting out her big secret.